Long Exposure: On Performing the Multiples brings together the works of Evrim Kavcar (b. Istanbul) and Marina Miliou-Theocharaki (b. Athens) whose studio practices consist of durational performance, sculpture, and time-based media. Taking the histories of nation-state formations in Turkey and Greece as their point of departure, Kavcar and Miliou-Theocharaki look at the material conditions of nation-making projects, collective memories and national imaginaries stored in objects and spaces. Both of their practices deal with the latent histories and ideological constructs embedded within spaces and materials which have gone through processes of gentrification, urban renewal, and displacement. Through physical engagements with the materiality of these charged spaces, they aim to create moments of disruption in which one can seek the parallel stories which are rendered invisible in the grand narratives of national imaginaries. 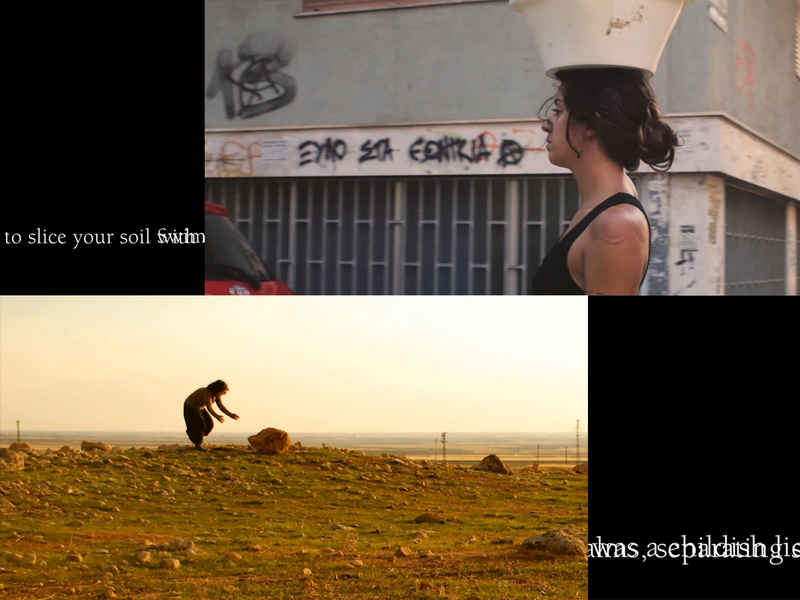 Marina Miliou-Theocharaki is a performer, writer and researcher based in Athens. In her work, she orients herself around definitions of the body, its subjectivity and sexuality within prescribed milieus. She focuses on moments when (un)belonging acquires sociopolitical dimensions, which she then deconstructs and filters through abstraction. Her work has been exhibited in venues including The Megaron Athens Concert Hall, Greece; ROMANSUSAN, Chicago, IL; Vienna Ballhaus, Austria; Figure One Gallery, Champaign, IL; Chicago Artists Coalition, Chicago, IL; the Comfort Station Logan Square, Chicago, IL; the Den Theater, Chicago, IL; Dfbrl8tr Performance Art Gallery, Chicago, IL; as well as the Cook County Jail, Chicago, IL. In 2015, she was awarded the BFA/Post-Baccalaureate Fellowship from the School of the Art Institute of Chicago as well as the 2014 George Roeder Undergraduate Award in Visual & Critical Studies. Miliou-Theocharaki is co-founder of the quarterly online curatorial platform Tamaas / تماس / επαφή, and was a 2016 Hatch Resident at Chicago Artists Coalition. She recently held the position as ASFA liaison and Curatorial Assistant for documenta 14, which in 2017 took place in both Athens, Greece and Kassel, Germany. For the past year, she has been working in Production for the choreographer and dancer, Alexandra Bachzetsis. After graduating from the sculpture department of Mimar Sinan Fine Arts University in 2000, Kavcar received her MFA from San Francisco Art Institute (2003) on a Fulbright scholarship, and PhD from Mimar Sinan Fine Arts University (2011). She has exhibited at venues such as the 28th International İstanbul Film Festival, Künstlerhaus Bethanien, DEPO, Hafriyat, PiST///Interdisciplinary Project Space, International Sinop Biennial and the 3rd Mardin Biennial. Lecturer in the Faculty of Fine Arts at Mardin Artuklu University since 2013, she was also part of an independent team of artists who started an alternative education program at Nesin Art Village. She is a member of LiKEN, an artist collective, and currently is an artist in residence at ZK/U – Zentrum für Kunst und Urbanistik in Berlin, made possible in the frame of a cooperation between the neue Gesellschaft für bildende Kunst (nGbK), ZK/U as well as DEPO in Istanbul.